An image of this mythical monster from local folklore is painted on a limestone cliff. The terrifying Piasa Bird is depicted as a scaly creature with deer-like horns, toothy grin, long beard, huge wings, talons on stubby legs and a long tail wrapped around its body. Local storytellers enjoy the legend of how this monster was defeated by an Illini chief in ancient times. The Piasa Bird is the mascot of nearby Southwestern High School, directly inspired by the ancient painting. Explorers Marquette and Joliet first noted this painting of the monster in Alton in 1673. The ancient pictograph could possibly have dated to the lost Cahokia civilization and probably depicted an underwater panther important to their mythology. By the time of American settlement of the area, the image of the creature was likely eroded away and the rock bluffs themselves were destroyed in the late nineteenth century. The legend, as told today in Alton, dates from an 1836 account by antiquarian John Russell. This version describes the defeat of a marauding flying creature by Chief Ouatoga. The chief discovered that the monster was vulnerable to attack under its wings, and used himself as bait to entice it close enough for hidden warriors to attack with poisoned arrows. 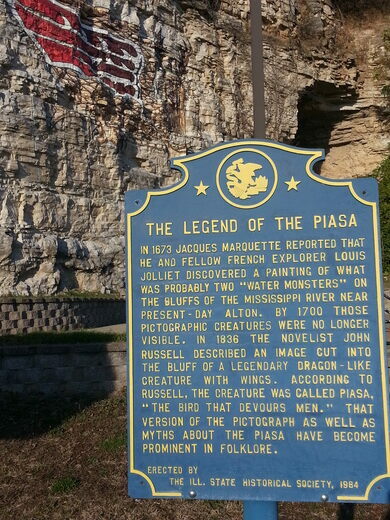 The Piasa Bird flung itself off the bluffs into the depths of the Mississippi River, where it lies to this day, perhaps dead, perhaps ready to return. Late in life, Russell admitted that he fabricated the entire story, and it has no direct connection to any Native American legends. 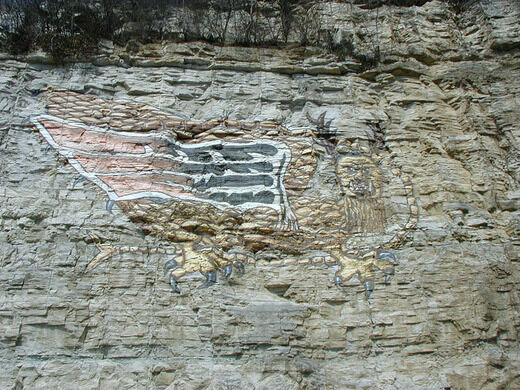 The Piasa Bird has been commemorated in Alton in numerous ways. The most recent bird on the limestone bluffs was painted in 1998 by the American Legends Society.